Mark Curtis let me take a few photos of his two-seater buggy while in Ohio last month. We took this to supper on the night I arrived. Very chilly that evening, so the extra-thick blanket you see below came in handy. I don’t know how many people you could fit in one this size (brings to mind the stunts with clowns cramming into a VW bug) but it was pretty snug with two of us inside. I’ll be sharing a few more shots of parts of the buggy. For now I thought you might enjoy seeing this storage shelf in the back, where Mark has his portable library, some essential books along with some other items. I have never seen a buggy shelf. The buggy looks like the style the Swiss Amish in Clyde and Waterloo. NY use with the sloped bottom. Have a great day. Surprising to learn it was snug for two,for it looks large to me. Admittedly, I am curous just what the book titles are and what other paraphernalia that’s on board. Please thank Mark Curtis for the snap shots! I’m curious what the blue thing hanging above the shelf is? I believe that is a light Debbie, and there may be a second one on the shelf. Mark also has an LED headband light. If I were Amish I think one of those would be quite handy, they are pretty widely used. Love the pics, looks like one of the books could be a bible, and could there also be a bible carrie bag? Nice fabric looks very cousy in there. Guess its lovely to sit in and have a ride out. Thanks for the pics really intresting :-). 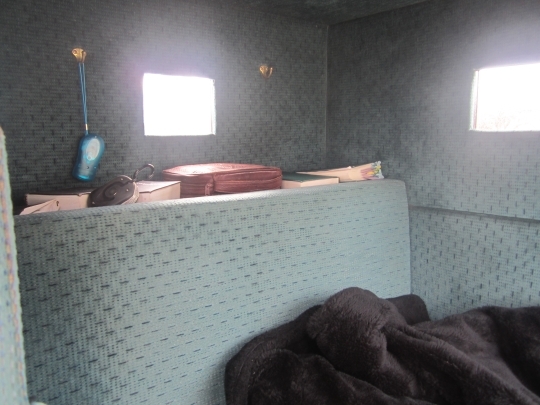 Thanks, Erik (& Mark) for the up close view of the interior of the back of the buggy. Is that a windshield wiper on the front window? I’m guessing it’s battery operated. 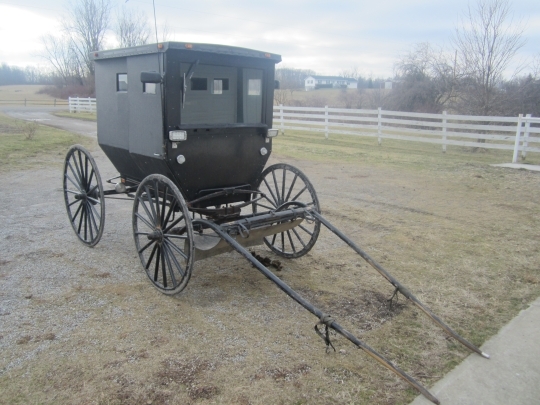 Is it a common item on buggies, or do the stricter Amish communities prohibit them? Also, are those side-view mirrors about a foot down from the buggy roof, even with the side windows? (Same question applies.) He seems to have ample reflectors! Thanks for the pictures! Does the back of the buggy open so Mark can put shopping bags, etc. in there? No surprise to see the books on the shelf, knowing Mark is an avid reader. I’m rarely without a book! Helps pass time when waiting for my kids’ after school activities. Glad to see he has an extra warm lap blanket. Well, I made a call to Mark to try to answer your questions about his buggy. Firstly, he told me that he hopes everybody forgives how dirty it is. He didn’t have a chance to wash it inside and out before Erik’s visit. The books on the shelf are his German/English Bible he uses for Sunday School. He just leaves it in the buggy. Also, there are a German/Englis New Testament and a German hymnbook he uses for church. And, there are two hymnals that he uses for the Sunday evening hymn sings. He has one hymnal for himself and one to share for visitors or somebody who forgot theirs. Yes, the buggy has a little door in the back that the SMV symbol is fastened to that opens to storage. The blue thing is a flashlight that Mark got while in Germany. He has one for each of his buggies. It doesn’t have any batteries. You pump a lever in the handle and it generates the electricity for the LED lights. Yes, that is a windshield wiper on the storm front. No, it is not battery operated. There is a know on the inside and it is hand operated. The other thing on the shelf is also a flashlight. It has batteries and is a combination flashlgiht and lantern. You can hang it from hook and have like 10 LED’s lit or you can hold it in your hand and have like 3 LED’s lit. It may seem snug but Mark has often seen as many as four in the buggy. One family in his church drives just a buggy and there are the two parents and four children. Sorry about the typos. My hands just aren’t what they used to be. That should be a knob not know that works the windshield wipers. and Mark has seen four in a buggy but not his buggy. On one occasion we were able to fit 6 grown adults into a Belle Center One-seater, which is what Mark drives. Obviously, they had no weight problems and we did it in the Summer with the storm front OPEN..
Great pictures of the shelf, books and lap robe. Thanks for sharing this with us, Mark. Good post as always, Erik.